Gene Alan Spickard, 73, of Frazee, MN left his earthly home suddenly on Friday, April 6, 2018. Gene was born in Highland, Indiana to Paul and Irene Spickard. He was the middle of three sons with his older brother Dennis and his little (taller) brother Richard. The three boys banned together to terrorize their mother and the neighborhood probably to the secret pride of their father. After completion of school, Gene married young and had 4 beautiful children-Paul, Mark, Lucas, and Sarah. Beginning his family in Indiana, he began is career as a pharmacy technician in Hammond Indiana. He soon trained and did insurance underwriting for Farm Bureau Insurance. Needing to work with his hands again, he certified as a Master Ford and Chevrolet technician all in Hammond, IN. Having spent his summers in Minnesota with his parents, Gene longed to move his growing family to the area permanently. He moved to Mahnomen, MN and became caretakers to the local motel until he could open his own mechanic and body shop in town. As typical for Gene’s mechanical mind, he chose to attain his journeyman’s license in plumbing and heating and open and operate Modern Plumbing & Heating which he relocated the shop to Perham, MN, working with his eldest son Paul. Gene moved his remaining family to the rural Frazee area to be closer to the new shop. He kept many of his connections to the Mahnomen area owning and maintaining the Professional Building, housing several businesses throughout the years. While running his successful plumbing business, Gene met his second wife, Christine and opened his heart to a pair of very young children, Heather & Josh, making a family of six. While working with the plumbing business, Gene’s creative mind developed another company, Pro-Master, inventing, manufacturing, and selling a portable live-well for fishing boats and a gas/wood stove for portable fish houses. Not one to sit still long, Gene’s next adventure took him to the Local 126/11 for high pressure plumbers and pipe fitters, bringing him all over the state for the next years to come. Throughout these careers and retirement, Gene was always building, fixing, remodeling, creating, and sharing these skills and joys with everyone around him. From renovation of every room in his own home, he has shared his craftsman ship in many family members’ homes also. Beyond remodeling, Gene began more woodworking skills, building his own kitchen cabinetry, furniture, frames, tables, and even a little cobbling. If someone told you it couldn’t be fixed, Gene would find a way to make it work again. Somehow between all these tasks and jobs, Gene was an avid outdoorsman his entire life. His love of fishing and hunting called him to the northern Minnesota area that offered year-round opportunities to do his favorite things. Learning the love of these hobbies from his own father, he spent many summers with his wife, brothers, children, nieces and nephews, and grandchildren in the life-long convincing of he being the best fisherman. His love of fishing was also shared with many of his closest friends in this area and on Lake Superior in the Silver Bay Marina on the North Shore, where Gene was able to live his dream of having a 28 foot Mariner vessel, “Last Chance”, that was slipped allowing him to “camp” on the water from June through September. 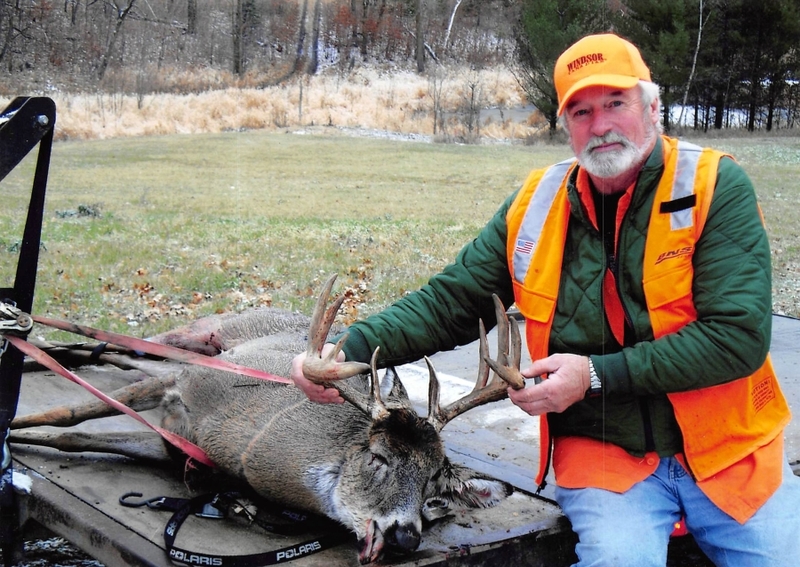 The winter months allowed Gene to spend several years at deer camp at Broken Arrow Resort in Naytahwash, MN, hunt Elk in the mountains of Colorado, and ice fish on secret lakes that cannot be named. Gene was an easy man to talk to as many learned in the daily coffee shop meetings or at home at 9 am in Chris’s kitchen. He was always full of jokes, great hugs, wise advice, and a helping hand. If you were willing to listen, he would teach any of the myriad skills he was a master. Gene’s presence will leave a gap in the lives of many, but will fill the heart with loving, cherished memories. Loved ones that will miss Gene until they meet again are: his wife Christine Spickard (Frazee, Children Paul (Tara) Spickard, Selma, AL, Mark (Renee) Spickard, Carr, CO, Sarah (Ron) Eckberg, Rochert, MN, Heather Guy-Spickard, Detroit Lakes, MN, and Joshua (Katie) Guy, Fargo, ND, 13 grandchildren, 2 G-kids, 3 great-grandchildren, brother Richard (Rose) Spickard, East Lansing, MI, Nieces and Nephews, Stacie (Tom) Capua, Midland, MI, Steven (Hanna) Spickard White Lake, MI, Andrew (AJ) Spickard, Fergus Falls, MN, Trixie the pug, Dog he pretended not to want. Loved ones that lead the path for Gene: Parents, Paul Spickard, Irene (Spickard) Simpson, & Gene Simpson, brother Dennis Spickard, & son Lucas Spickard. A celebration of Gene’s life will be Friday, April 13, 2018, at the David-Donehower Funeral Home, 609 US Hwy 10 East, Detroit Lakes, MN 56501. A gathering and lunch at 5pm, followed by a service at 7pm.